CALGARY, Alta., Canada, March 15, 2019 – Sean Melton of Orlando, Fla./Ohio State University, won the international senior men’s title at the University of Calgary International Cup in Calgary, Alberta, Canada. The United States edged out Canada in the USA-Canada dual match. Competition concludes tomorrow with the event finals at 7 p.m. MT. In the all-around, Melton posted an 83.625 for the title, with Canada’s Jackson Payne in second (83.275), and Justin Karstadt was third (81.450). 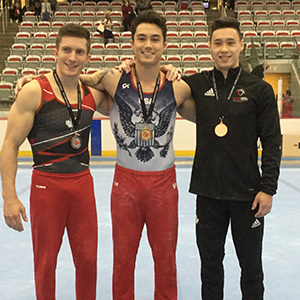 Robert Neff of Brookfield, Wis./Stanford University, was fourth (81.025), with Genki Suzuki of North Wales, Pa./University of Oklahoma, fifth (80.275), and Riley Loos of El Dorado, Calif./Technique Gymnastics, sixth (80.275). The U.S. gymnasts who will be competing in the event finals are: floor exercise – Loos, Melton and Suzuki; pommel horse – Neff, Suzuki and Melton; still rings – Melton; parallel bars – Neff and Melton; and horizonal bar – Melton and Suzuki. 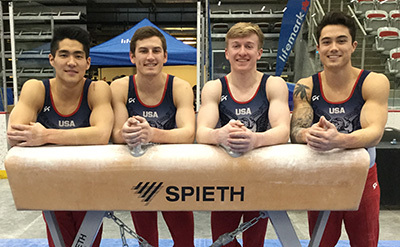 The top six male gymnasts, plus ties, in the senior and international senior divisions advanced to the finals. The U.S. gymnasts did not perform two vaults to be eligible for the vault final. In the team competition, the USA posted a 247.975 total, besting Canada by 0.700. Canada earned a 247.275. The individual scores for the U.S. gymnasts are below. Melton: all-around, 83.625 (1); floor exercise, 13.625 (2); pommel horse, 13.800 (5T); still rings, 14.575 (1); vault, 14.000 (3T); parallel bars, 14.050 (2); and horizontal bar, 13.575 (2). Neff: all-around, 81.025 (4); floor exercise, 12.300 (6); pommel horse, 13.950 (4); still rings, 13.250 (5); vault, 14.550 (1); parallel bars, 14.200 (1); and horizontal bar, 12.775 (6). Suzuki: all-around, 80.375 (5); floor exercise, 13.600 (3T); pommel horse, 13.800 (5T); still rings, 12.975 (7); vault, 14.000 (3T); parallel bars, 12.625 (7); and horizontal bar, 13.375 (4). Loos: all-around, 80.275 (6); floor exercise, 14.075 (1); pommel horse, 13.150 (6); still rings, 14.450 (4); vault, 14.450 (2); parallel bars, 12.900 (6); and horizontal bar, 12.325 (8). For the team competition, the format was four gymnasts compete on each apparatus, and three scores counted toward the team score in the head-to-head dual with Canada. The top six on each apparatus advanced to the event finals. The event has live scoring on the web and mobile, as well as additional information on the official website.